Ruth Kessler lived in Poland and Israel before moving to the U.S. 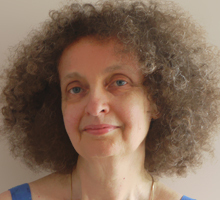 Her publications include Fire Ashes Wings (poems giving voice to women in myths and the arts), and over seventy poems in journals and anthologies, some of which received special distinctions. Her poem “Hummingbird” was made into a limited-edition artist book, and three poems were set to music as the choral composition Eve - Absinthe - Alice. She has also written two full-length poetry collections (The Country of Elsewheres has been a finalist in several book contests), a short fiction collection, and a children's book. Work-in-progress includes a collection of light verse and poetry translations from the Hebrew. Awards include Individual Artist Grants from The New York State Council on the Arts, WNY Artist-in- Residence grant, as well as residencies from Yaddo, MacDowell, VCCA, Ragdale, the Saltonstall Foundation, and a VSC fellowship. She has given numerous readings of her work, including as a guest poet at the Women in Music Festival and Women and Poetry Festival. She has also given presentations about poetry translations and taught creative writing in college and community settings.